The Graduate Aerospace Laboratories of the California Institute of Technology (GALCIT) is known around the world for its innovation and cutting-edge experiments. Since its inception in 1928, GALCIT’s strength has been to attack fundamental problems in the science of engineering. The solutions to these problems have often had very broad societal impact. One such problem is how to reduce the carbon footprint of airplanes. To tackle this problem, Morteza Gharib, Caltech’s Hans W. Liepmann Professor of Aeronautics and Bioinspired Engineering, and Dr. Emilio Graff, Research Project Manager in Aerospace, partnered with University of Arizona professor Israel Wygnanski ("Wygy"). They focused on the vertical stabilizer of a plane, which is colloquially referred to as the rudder, or the large “tail” of the aircraft where companies usually place their logos. The Vertical Stabilizer Project surpassed everyone’s expectations. The project used active flow control (AFC) to show that the wing efficiency can be increased, which in turn allows for the entire vertical tail to be shrunk, reducing drag, weight, and ultimately the plane’s carbon footprint. To learn more about the project and its path to success, ENGenious interviewed Professor Gharib and Dr. Graff. ENGenious: How did the project get started? Gharib: Professor Wygnanski, who is a world-renowned expert in aerodynamics and active flow control, approached me about whether we were interested, and at the time Emilio was joining us. I saw this as a golden opportunity. The project brings back the traditional GALCIT, where we basically started the Southern California aerospace industry. Graff: Wygy’s research group had been employing sweeping jets (a form of “fluidic amplifier”) in various configurations to show the potential benefits of the technology. He then joined NASA as the principal investigator of the project to apply sweeping jet technology to a vertical tail of a commercial aircraft. Boeing was also part of the project, as they had been looking at active flow control for various applications and in fact had already been working on testing the system on the tail with Rensselaer Polytechnic Institute. Professor Gharib received a NASA research grant under the Environmentally Responsible Aviation program to explore the potential of sweeping jets and synthetic jets on the same vertical tail model. 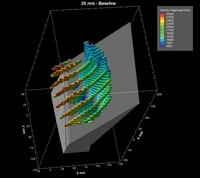 Boeing additionally provided funds for Professor Gharib’s group to investigate the flow physics behind the sweeping jet actuators and their effect on the flow. Gharib: The Vertical Stabilizer Project is especially interesting for me because my PhD thesis was focused on a similar topic: manipulating and directing fluid flows through active flow control. ENGenious: What part did GALCIT play in this project? Graff: We actively participated both in the preparation for the large-scale tests, which meant producing all the hardware, and also on the scientific side to attend the full-scale tests as a representative. Gharib: Caltech is the only place in the country that can really rig up this new technology and implement it to become reality. Thus, GALCIT was charged with combining its historic tradition of aerospace innovation with its modern facilities. But this wasn’t a resurrection—this was a continuation of a tradition of excellence. ENGenious: How did the investment from the Lucas family and the reopening of the wind tunnel impact the project? Gharib: It was the Lucas family’s generous support that allowed us to revamp the Guggenheim Wind Tunnel into the modernized Lucas Adaptive Wall Wind Tunnel facility, which made this project possible. If the wind tunnel hadn’t been reopened, this project may have never taken place here at GALCIT. A whole country and nation is benefiting from the Lucas family investment. Graff: The Lucas Tunnel was an ideal facility due to its size and quality. Nearly 800 hours of wind tunnel time were used to characterize the behavior of the sweeping jet system and eventually arrive at the configurations to be tested on a full-scale 757 airplane tail. ENGenious: What was the main goal of the project? Graff: To prove that active flow control can increase wing efficiency. ENGenious: Can you be more specific? Graff: The rudder of an airplane is most important in two situations: (1) when an airplane faces a cross-wind and needs to go straight, it points its nose in the direction that the wind is coming from, and (2) in the case when an engine fails. If the engine fails, the airplane will naturally turn toward the dead engine due to the asymmetry between thrust and drag forces, and it’s up to the rudder to keep the plane flying straight. The shorter an airplane, the larger the tail must be in case the engine is lost. A wing or tail generates force by redirecting the air that flows over it. A symmetrical wing won’t generate any force, because the air flows above and below follow the contour of the wing. But if an asymmetry is created by slightly deflecting a wingtip, air flow above the wing is pulled down, generating a lift force. When a wing needs to generate more force, it will deflect its flap at a larger angle—just as a bird flaps its wings. But this deflection comes at a price of energy and efficiency. Gharib: Believe me, if birds had the option not to flap, they wouldn’t flap. Graff: There’s a point of the deflection angle where the flow becomes “separated,” creating drag and impacting efficiency negatively. Thus, in order to make up for this inefficiency, vertical tails are designed largely enough to operate well into the region where the flow becomes separated. This means the size of the tail is dictated by the inefficient operation of the wings! ENGenious: What was the idea behind this project? Gharib: The idea was to blow high-speed jets of air across the rudder’s upper surface—pushing away slow-moving air, sucking in faster air, and ultimately limiting the separation of the flow. Because the tail is designed for a rare condition, it is one of the most low-risk regions to tweak on an airplane—perfect for the GALCIT team to experiment with. If active flow control was successful in increasing wing efficiency, then the entire vertical tail could be shrunk, reducing drag, weight, and ultimately the plane’s carbon footprint. ENGenious: What were the findings? Gharib: Our initial base estimation was not only correct, the results were even better. There was a 20 percent lift increase; that can translate into a huge amount of fuel savings, stability, and also a much lighter airplane. Graff: The project proved that by reducing the size of the rudder, or vertical stabilizer, of an airplane, the amount of CO2 emission and carbon signature will decrease, thus causing less environmental impact and decreasing the overall amount of fuel needed. ENGenious: How will these results impact commercial flights? Gharib: The overall fuel savings make more of an impact on longer flights due to the amount of time spent actually flying. The fuel savings are in the Los Angeles-to-Hong Kong and Los Angeles-to-Frankfurt flights, where you’re in the air a very long time with respect to how much you spend landing and taking off. ENGenious: What challenges did the project face? Graff: One of the biggest challenges was in the transition from a scale model to full scale. On one side, Dave Bauer and his team at Boeing showed a tremendous amount of consistent focus in turning a real airplane tail into a wind-tunnel test article. At first, you may think that this should be easy; if it can survive flight, it can survive a wind tunnel. But this tail was modified to allow for the plumbing, and the wind tunnels like to work with huge safety margins to protect the equipment. Everyone on the tunnel staff was very excited to see the tail; it really was an impressive beast. Under some conditions, it would shake the whole building! On our side, we had to fight to convince NASA and Boeing that our predictions based on the Lucas tests were correct. This was an uphill battle because simulations at the time showed that we were wrong and the system could not work. Just prior to the test, we argued that we should start ramping up the system slowly—we were still convinced our predictions were correct. We were vindicated immediately when the first data point with all the jets running exceeded the structural limit imposed by new analysis of the modified tail. Gharib: Also, it is important to note that in four years, the project went from concept to flight! Graff: Yes, the test of the full-scale tail was a success, proving that sweeping jets can increase the effectiveness of the rudder by significant margins—enough to make an impact on the fuel consumption due to the tail. It is important for the future of aviation to find ways to make airplanes more efficient. Next, the objective is to make wings, in general, more effective using similar techniques. ENGenious: What does the future have in store? Gharib: This project has had a huge impact on the way that airplanes may function in the future. The “big” test is on an actual 757 sometime in 2015. If all goes as predicted, there may be a substantial reduction in the amount of fuel consumption. Graff: GALCIT has played a huge role throughout this entire project and continues to do so, from small-scale to larger-scale testing. We have shown that we at Caltech can do the fundamental studies and the model tests and the measurements—but also, when it comes time to playing with the big boys, we can be there, too. Everything we delivered for the full-scale test worked from the start. Keep in mind that we don’t have a huge engineering staff—two people maximum worked on this at any given time. 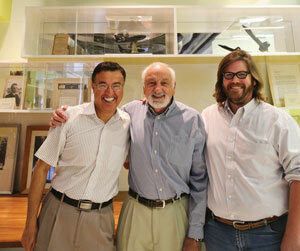 Morteza Gharib is Hans W. Liepmann Professor of Aeronautics and Bioinspired Engineering; Director, Ronald and Maxine Linde Institute of Economic and Management Sciences; and Vice Provost. Emilio Graff is Research Project Manager in Aerospace and Manager of the Lucas Wind Tunnel.